Serendipity Reviews: Sunday Salon - Graphics Frenzy. Sunday Salon - Graphics Frenzy. A couple of weeks ago I was moaning about my lack of reading. So, I grabbed the bull by the horns and solved my slow reading, with an injection of graphic novels. I have read four lovely graphic novels over the last couple of weeks and rather than doing long reviews of them, I am going to give you a quick run down of the story line and what I thought of them. I still have so many books to review and not enough posts to use for them. I am adamant that I will not write more than one post a day as I basically don't have time and I don't think it is fair on you guys. So here goes. 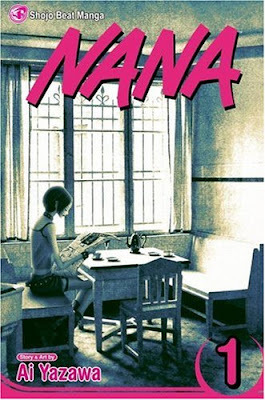 I will start with the Nana series by Ai Yazawa. Anyone read any of these? I was lucky enough to pick up the first two books in the series at the library. Until I read these, I had never heard of 'manga' and 'shojo' and I didn't have a clue what they meant. For those of you, who like me often live in a world of graphical darkness, they mean the following. Manga is a basically a comic or cartoon book in any format developed in Japan in the late 20th Century. Shojo is the Japanese word for girl. The Nana books are basically about two very different young girls who happen to have the same name Nana. In the first book, we get to meet both Nana's. Nana Komatsu, a romantic young woman, always falling in love with the wrong person and Nana Osaki, a rock chick, desperate to make it big in the rock and roll world. Within the first book, neither character actually meets. You follow them on their journey to moving to Tokyo, their reasons for going and the decisions they have to make. Within the second book they actually meet on the train journey to Tokyo. They find they are total opposites to each other, yet by the end of the book they both end up sharing a flat. On one hand, I loved the character of Nana Osaki, she is a strong and determined young lady who doesn't let anything linger on the surface. She keeps everything well hidden in order to protect herself. On the other hand I hated Nana Komatsu, she was really annoying and very childish. She needs a major dose of maturity, in order to make me like her. I found these books very entertaining, if a little hard to read because you have to read them from the back to the front and from right to left, which took me a little while to actually get into. This style of layout is in keeping with the original Japanese comic format. This are quick to read and very entertaining. Definitely worth a read, if you are short of time and need a quick book fix. Moomin - the Complete Tove Jansson Comic Strip - I am pretty sure that this is not the complete comic strip and that there are actually a few other books circulating with different Moomin comic strips in. This book was volume 4 and consisted of five different comic strips. The stories covered Moomin Papa's invention of a time machine which transported the Moomins back to the Wild West and to eighteenth century France. My favourite out of all the five comic strips was a story about a comet landing on Earth causing a great tidal wave. In Moomin style, everything works out in the end and all the stories are just lovely. I would highly recommend one of these books as an introduction to the Moomins. I dare you not to fall in love with these cuddly creatures. I am a big fan of the Moomins and I am hoping to get hold of all the original paperback books. Creatures of the Dark by Neil Gaiman and Michael Zulli. Whoa, this book consisted of a couple of very dark tales. The book has two of Neil Gaiman's stories about enigmatic animals and their supernatural influences on the human world. The first story 'The Price' is about a friendly black cat which makes a new home for itself in a cottage with a family. Every morning the family find the cat has been viciously attacked. Worried and concerned about his safety, they watch to see what is hurting him, only to find that their house is not as safe as they had thought. The second story ' The Daughter of Owls' is a recount of a historical tale of a baby girl abandoned at a church and doomed to spend the rest of her life behind the convent walls until the men of the local town take an unhealthy interest in her. Both of these stories are really dark and not for the fainthearted. This is not a book I would allow children to read as I would not have said the stories were suitable. However if you are looking for a read for your RIP challenge, then I would highly recommend this book. The pictures reminded me a lot of the graphic version of Coraline that I reviewed recently. So that wraps up my graphics frenzy this week. Have you read any good graphic novels recently? I love the sound of The Price I do like Neil Gaiman I must admit. I remember The Moomin programmes quite fondly from when I was little but before your blog had no idea about the books so am definitely going to have to investigate further. As you know I am currently on a Tintin reading spree! And I think that will help me check out more of graphic novels. I've never read a graphic novel but I am thinking of trying one sometime. As a matter of fact, I just finished an amazing graphic novel called Britten and Brulightly. Amazing both in story line and artistry. I will be looking for me like this. Happy reading! I've never read any graphic novels, but maybe I'll try them in the future! I've heard such good things about the Nana series! Manga does take some getting used to, but it becomes much easier with time.. By the end of Emma I no longer even noticed I was reading right to left! The Moomin sound fantastic too! And while I haven't read Creatures of the Night, I did read the original short stories and loved them. They are indeed dark, though. Graphic novels a on the pricier side here so I won't be focusing on reading those for the time being. But still, the ones you have here are so interesting! Carmen, I would definitely recommend these books, especially the Moomins. I am exhausted after yesterday. It took us four hours to get home, because the Victoria line was shut. I did look out for you. Spent far too much money. Guatami - The Tintin series sounds good too. Tintin was not as big over here. Jen - they would be ideal reading for you at the moment. Nice and quick easy reading to fit out your new addition's needs. Frances - Britten and Brulighty sounds really good. I shall investigate. Passionatebooklover - definitely recommend you trying one. Eva - The Fables sound good too. Nymeth - I may try and get the original short stories by Neil Gaiman to read. I think I would enjoy them. Emma sounds good too. Alice - do they have them at your library? I have to read Manga for one of my book challenges, so I'm glad I stopped by! The Nana books look like something I would like. I know that it took me a while to get used to reading the Emma books from back to front. I tried one Manga novel which a lot of my blog friends recommended but I just had such a hard time "following" the way you are supposed to read a manga. It really distracted me from the story. I may give one another try sometime though. Now graphic novels I do enjoy and I haven't read one in a while but I recently won a copy of The Impostor's Daughter which I'm really looking forward to! The Nana books do sound entertaining. The other two do sound like good ones for the RIP challenge. Fun posts. I do love reading graphics, too.